As usual, we are participating in the Friday 5 where the topic is "Spring". How timely! Here are a few things that have had me anticipating Spring this week. 1. In anticipation of Spring's arrival today, I did a little Spring cleaning yesterday and finally put away everything that had a snowflake on it or anything that resembled winter. Why did I still have snowflake decorations up you ask? Good question. I guess just laziness. But give me some credit, I don't still have my Christmas decorations up. That is more than I can say for some people. And when I say some people, I mean the two houses I saw yesterday as I drove up north to visit a friend. When I say Christmas decorations, I mean full front yard decorations! It seriously looked like these families could compete on that show "The great Christmas light fight". 2. 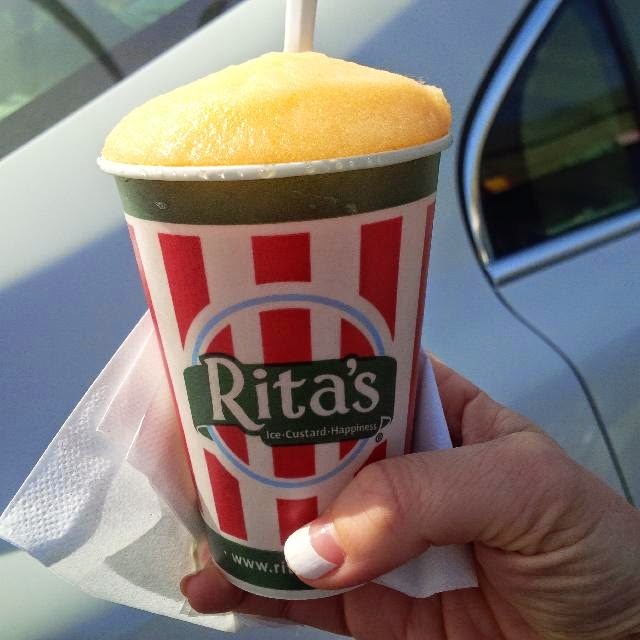 I totally forgot that Rita's Italian Ice gives out Free Italian Ice on the first day of Spring. I ended up going there after lunch yesterday for my first ice of the season. Had I remembered I would have just waited and gone today. This flavor was called Georgia Peach! 3. It's killing me that the weather has been nice and I haven't been out there running. Yesterday Miss Baylee went with me to run some errands. I guess I really didn't have a choice because when I came out to the driveway, I saw she was already sitting in the passenger seat in the car. I actually came out through the garage so I saw her from the front through the windshield and it startled me at first because something was in my car. When I noticed it was her I just started to laugh. She really wanted to go with me so how could I tell her No. ( I must say that I was loading and unloading things in my car and that is why the car door was left open when I went in the house). Okay, getting back to my point. After the errands we stopped at a track at the hospital since it was on our way. It is a walking track and it was quite nice. I always see it when I go to my appointments but I never make time to stop and use it. It felt good getting Baylee out for a walk. At one point I even started to do a little jog and surprisingly I felt okay. 4. 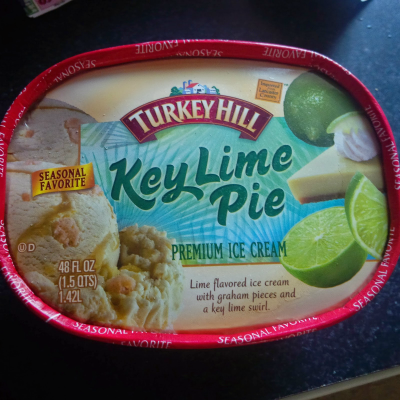 This Keylime Pie Ice Cream from Turkey Hill is by far going to be my favorite snack this spring. It is AMAZING and I should not admit this but it only took me a week to eat the entire container by myself. I had a bowl ( or two) every night! I need to get another container soon seeing that it is only a Season flavor! 5. The last thing that has me anticipating Spring is the April Fools race. I know you are thinking WHY IS SHE RACING. But hear me out. I've gone to this race for the past couple of years and I actually got a free entry for this year. I was debating on not even using it but my sister just found out that she has off that weekend. Since we don't really have to travel for it we decided to just go and hangout at the beach for the weekend. 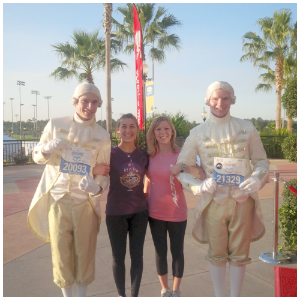 The race is an easy one along the boardwalk. I did it last year when I was hurting WAY more than I am now so I'm just gonna do a little "hobby jog" and I'll be fine. I'll walk it if I have to. I saw a ton of walkers last year. What has got you excited about Spring this week? That picture of Baylee is just too adorable! She really wanted to head out with you and show you how good of a girl she'd be if you took her with you! It's amazing how dogs can coerce us into taking them places with their sweet faces. I am sure Baylee enjoyed the walk at the track and riding with you in the car! 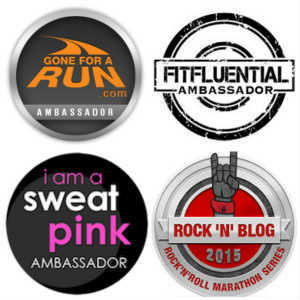 I'm am most looking forward to my trip next month to Boston and the big race! Ha ha! I love that you left the door open and your dog jumped in. That look on her face is priceless. You know she's saying, "Please take me with you!" I wouldn't say no either. Happy Spring! I'm kinda bummed that I won't be able to drop by a Rita's today! I'm so happy Spring is here, even though it's snowing outside right now! Aw, I love your pup! Mine doesn't like being left out either, but he needs a stool to get in the car ;-) I might have to check out that ice cream. I'm obsessed with the key lime Chobani flip, so this has to be even better! Both of my dogs love to ride but one of them gets car sick. I love key lime pie! Key lime yogurt is good too. Dogs are so good at that face, I wouldn't be able to resist her either. That key lime ice cream reminds me that Blue Bell will have their summer flavors out soon, including key lime pie with graham cracker chunks. Awwwh, such a cute puppy. I am so, SO glad that Spring is here. I can't wait to run in the beautiful spring weather. I'm so looking forward to spring weather! I hate winter! Oh that picture of your pup is just too cute! I can't wait for the spring weather to get here! Everyone keeps talking about this Rita's. I'm so jealous, we have no Rita's here in Iowa. Please send us one LOL! I am SO jealous of your weather right now! Rita's is an Italian Ice place! It's only open Seasonally though. aw, my dog loves going for rides in the car as well! so cute! Ohhh, key lime pie ice cream? I need it to get a little warmer here for that, but that sounds amazing! Baylee looks too big to even fit in the car! Too cute!! 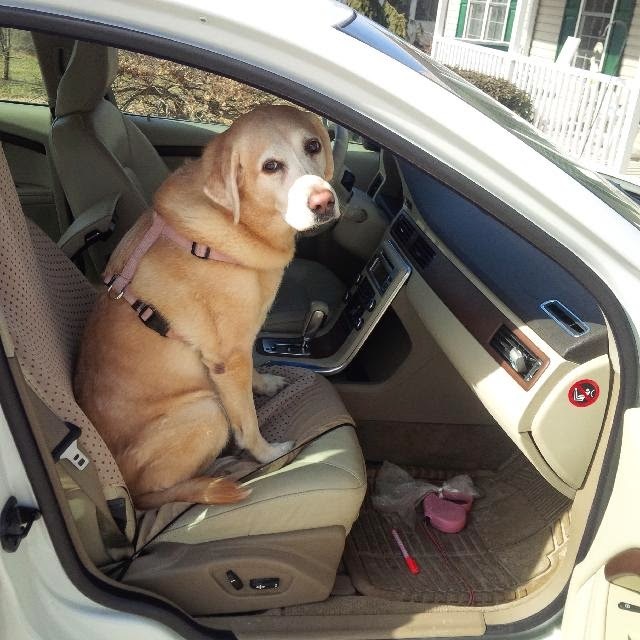 Baylee looks so cute sitting in the car; she's like, "are we going yet, or what?" I may have to check out this ice cream, though - ugh! Key lime is my FAVORITE!! Hope you have a great weekend! Oh gosh, Baylee is just the cutest AND...I am heading to the grocery store immediately after work to look for the Key Lime ice cream, I LOVE anything Key Lime and I have to find this ice cream!! Have a great weekend! You are such a good dog mommy - and that picture is adorable! Let's see, what am I excited about for spring? Well, it would have to be some of this snow melting in the neighborhood. The snowbanks have surpassed my height actually nearly doubled my height and the streets are super narrow causing me to do several training runs for Boston on the treadmill. I was just wondering do you guys have an Instagram account? Ive been forgetting about Ritas the past couple of years. I did not know there was a Key Lime Pie ice cream! You are like the fourth person that has mentioned Rita's on their blog...I feel like I've been missing out! Haha. 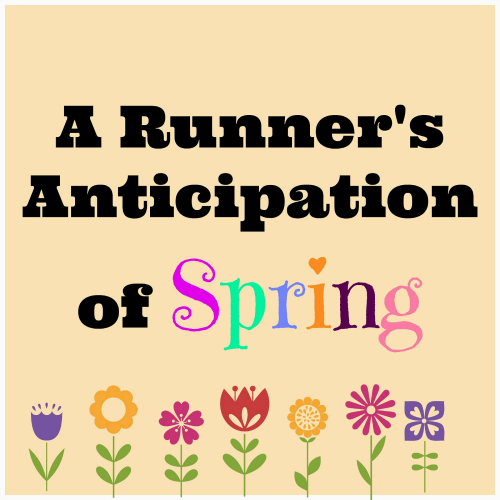 I am about to head out for an 18 miler and I can't wait to see everything that has bloomed since last weekend. Wheee!!! Great list. Always love free rita's. Cant beat free. I was disappointed that there weren't any near my work to go over lunch. I don't know if my first comment went through but that ice cream looks to die for! And I love that you put away anything with a snowflake on it...that's what I call spring cleaning! I love keylime pie anything:) It's a weakness, LOL. Actually last weekend in spirit of Spring getting here much earlier than normal, I even stopped and grabbed myself a Cherry Lime Rickey, YUM!!! Be proud it took you a week. I cannot bring ice cream into the house because I would finish that in a day!